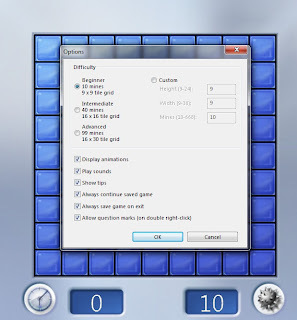 Minesweeper is a deceptively simple test of memory and reasoning—and one of the most popular Windows games of all time. 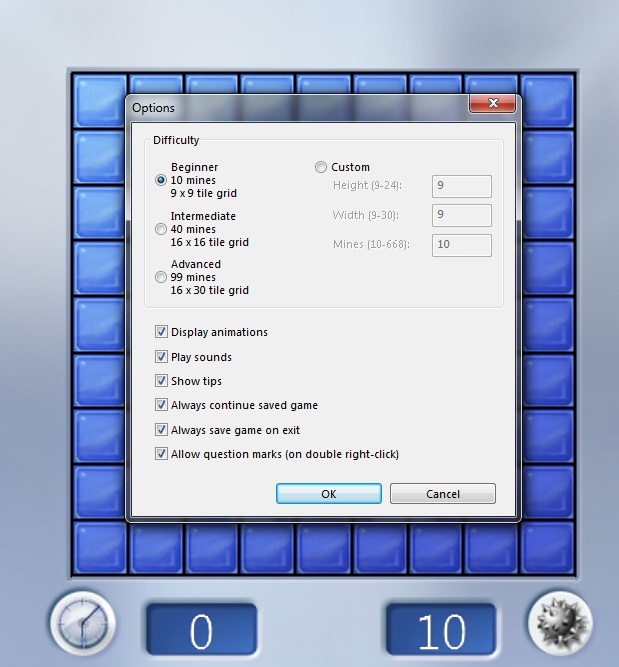 The aim of this game is to find the empty squares and avoid the mines. A new window will opens as in figure. Press any of the tile in the figure. 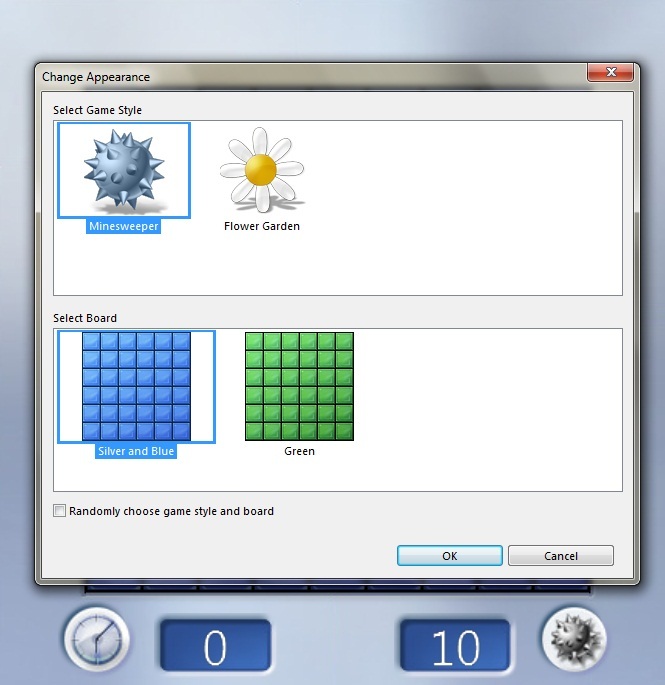 You can select any tile as you wish, by pressing the mouse left key by placing cursor on the tile. There will be empty tiles and some with numbers. 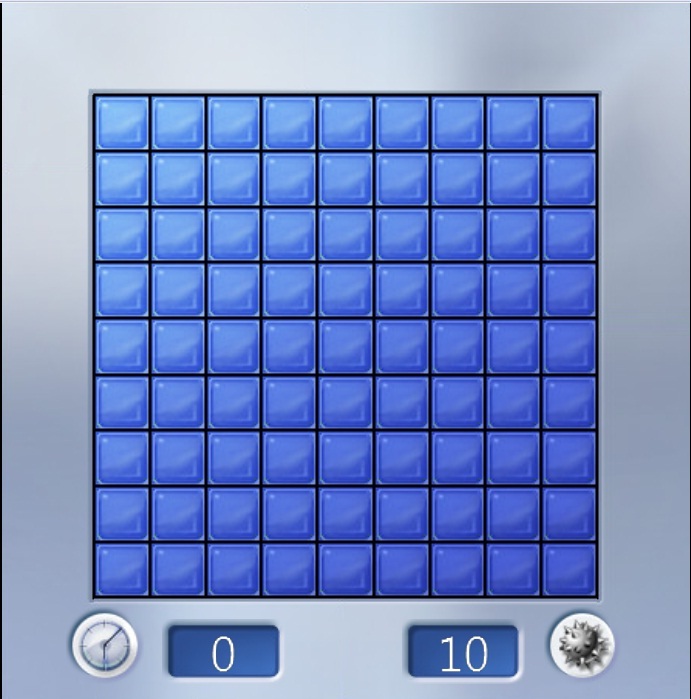 Number of mines in the tiles surrounding a tile will be shown in it. 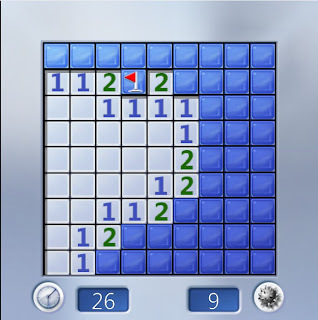 You have to continue till you open all the tiles with out the mines. 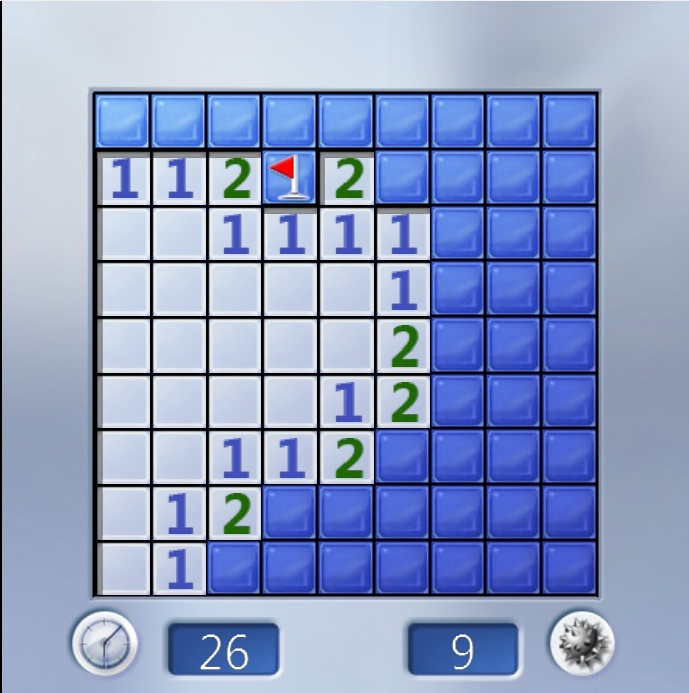 The game will be lost once you click on a tile with a mine. The time how long you take to play will be shown in bottom. You can flag a tile which you are sure that contains a mine, by right clicking on it. 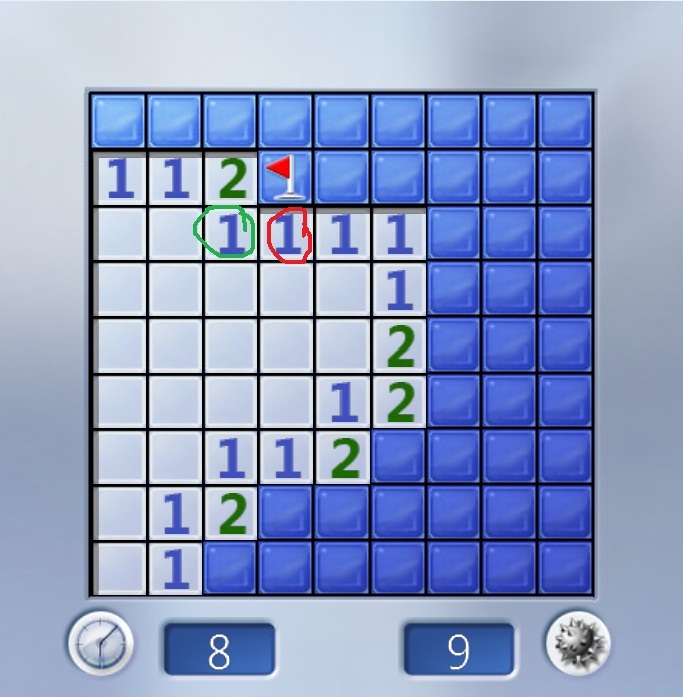 The number of tiles with mines that are to be flagged is shows below side of the time tile. · Start a game as said above. · Click on any of the tile you like. · The game is set that the initial tile you click will not contain a mine. 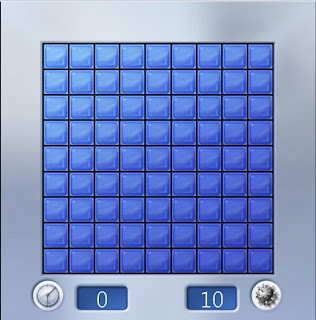 · The tile that you click and some of the tiles surrounding it will be opened. · Continue clicking on other tiles to unlock all tiles without mines. · Flag the tiles that contains a mine(but this is not compulsory). 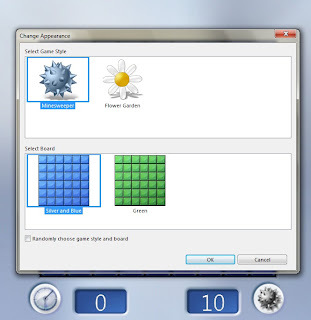 · The main advantage of flagging is that, when you have flagged all the tiles surrounding a tile with number, you can open all other tiles around it by just clicking both mouse buttons by placing mouse on the tile. This is explained below. · Here the green circled tile in numbered 1. This means that there is only one tile with mine around it. Here there is only one tile around it. So we flag it by right clicking on it. · Now on looking on the red circled tile, it is numbered 1. Already one tile around it is flagged( tile where tile is present is already found out). 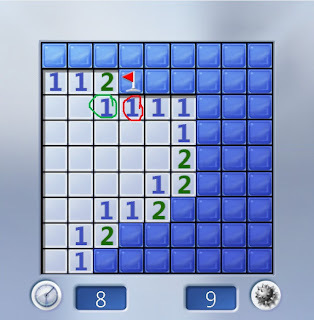 · So you just need to click on the red circled tile (both right and left mouse keys together), to unlock the tiles around it which does not contain a mine. This is shown in the next figure. · This is so useful and reduces time when there are more tiles to open. · You can open options tile from Game> Options or by pressing F5 key. · Options tile open as in figure. There are 3 difficulty levels. You can choose one you like. But it is better to start studying game with Beginner level. You can also make a custom tile. · You can see statistics of games you played till from the statistics option. · You can open statistics option from Game> Statistics or by pressing F4. · Statistics opens as in figure. Statistics at different difficult levels can be viewed separately . You can also reset your statistics by pressing the reset button. Game> change appearance or by pressing F7 key. You can change the game style and board style from the tile that appears. · Concentrate more on accuracy than speed. Just try to win the game. Speed will increase automatically. · Avoid guessing unless there is no other way. · The only technique to play the game is by PRACTICE. There is no shortcut. There is no other way. You study its tricks as you play more and more game. You can see the speed you finish a game automatically. You are your tutor. 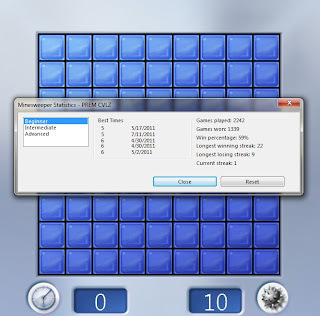 How minesweeper works so that the first click you make is not on a mine? It is really nice to visit your article. I could get lot more knowledge from your article.. thanks for sharing.